v3 = plua2.0, save to SD, BMP format, fixed directory creation problem so even intial save works now as the directory is created at start-up. JazzyDraw v3.0 freeware for Palm treo phone and pda, PalmOS free downloads. 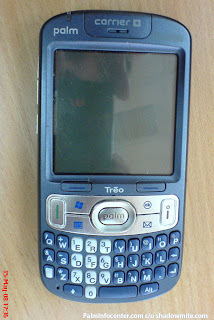 TreoSpot v2.5 freeware for Palm treo phone and pda, PalmOS free downloads. VisualCalc v1.6 freeware for Palm treo phone and pda, PalmOS free downloads. No Special Treatment For Android, Nokia Interested In Adopting Android Too? 裡面跟時間管理有關的只有一個 Open Source 的 GTD 工具 Android Shuffle, 其餘大多數是與多媒體或網路有關的應用程式. 這並不代表 Android 上不注重這些實用小工具, 而只是表示 ADC 的主題確實是專注於多媒體與網路有關的嶄新應用. PalmAddicts: TX - still better than an iPhone at streaming radio! - Fix memory leaks and other bugs identified while running under POSE. - Beep parameters are configurable. 1src Forums - Convert WM Styletap data back to .pdb for use on PalmOS? eeepc 代替 PDA是否可行呢? - EeePC - Hong Kong PDA User Group 香港派樂用家協會 - Powered by Discuz! IntoMobile: Palm Foleo to resurrect with WiMAX connectivity? Palm Foleo to resurrect with WiMAX connectivity? Is the Palm OS Dying? Should You Care? Some believe Palm OS smart phones are a dying breed--but there are good reasons not to count them out yet.